Cut off all the hard crust from the bread (I bake brioche with my bread machine and I cut off the bottom and sides) and then cut into 1 inch cubes. Put the brioche cubes on a baking sheet and place in the oven until lightly toasted about 5 minutes. Remove from the oven and set aside. Put half of the bread cubes in the large bowl. Put aside the rest of the bread cubes. Make the custard. Whisk eggs and sugar until smooth and add coconut milk, vanilla and rum. Add coconut flakes and mix well. Pour 1/3 of the custard into the bowl of bread cubes. Toss them gently to coat all the bread cubes with the custard. Divide the bread cubes into 15 ramekins. Divide rest of the bread cubes on the top of each ramekin. Pour another 1/3 of custard on the top. You can press the bread slightly but don't press too hard otherwise you will lose the fluffy texture. Pour rest of the custard mixture on the top again to make sure all the bread is soaked. Let sit for 15 minutes in room temperature. Or you can put them in the fridge for overnight. Put ramekins on the baking sheet and cover with foil. Place in the oven and bake for 30 minutes or until the custard is done. If you put the pudding in the fridge overnight, it will take about 20 more minutes to bake. To check the custard, insert the knife in the middle and gently press the bread. If the custard is still running, put it back in the oven with cover. While the pudding is baking, toast the coconut flakes in the frying pan with low heat. When the coconut turns golden brown, take out from the heat and put them in a bowl. 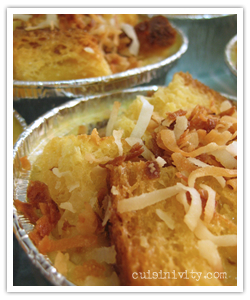 Before serving, sprinkle coconut flakes on the top of each pudding cup.